Thai fish sauce, or fermented fish sauce, is a staple throughout southeast Asia (not just Thailand). It makes a great substitute for soy sauce. I use it instead of soy sauce now because it's so much better for you. Since the fish is allowed to ferment for several weeks, you end up with a highly nutritious condiment. Thai fish sauce can also be added to soups or stews, or anytime you want more “umamai” flavor in a dish. I use it in everything from beef stew to chili to barbecue sauce — it really boosts the flavor. Fermented fish sauce is also used in making ketchup. This recipe is adapted from Sally Fallon Morell's recipe in her book, Nourishing Traditions. 1. Cut up fish into small pieces and place in wide-mouth mason jar. 2. Cut up the lemon rind into small pieces. 3. Add sea salt and press down with a wooden pounder or meat hammer. 4. Add remaining ingredients to jar and stir together. 5. Add additional water to cover fish if needed — water should cover fish but be sure to leave at least an inch from the top of the jar. 6. Cover and leave at room temperature for about 3 days. 7. Transfer to refrigerator and let sit for several weeks. 8. Strain liquid through a strainer (you may use cheesecloth if you like) and bottle the liquid (old soy sauce bottles are great for this). Discard the solids. 9. Store fish sauce in the fridge. It will keep for several months. interesting..i purchased some fish a while back… for homemade ketchup… but never made it… i may try this instead. Oooh, cool, thank you! Gonna try this. I was inspired to make some when you mentioned it a few weeks back. It is still fermenting because I have been afraid to strain it for fear of ruining my strainer. :) Someone had commented that they had to throw away their strainer after using it for fish sauce. Oh good to know — I’ll have to use a cheap strainer when I strain mine! You never be able to use the lids for the jar for anything else either, LOL! That’s the truth— stinky! I even have to hold my breath when I use this! A friend of ours went to a Thai restaurant and when he finally located an offending smell (in the condiment jars at his table) he had the waiter remove the fish sauce. That cracked us up, we can so NOT relate, since we love it so much! Thanks Ann Marie, this is so timely because I’ve been wanting to make some of this in a Pickl-It jar. Would there be any modifications to the recipe for a Pickl-It jar other than the usual one of omitting the whey/starter? I don’t know I haven’t tried it with a PicklIt jar. Oh my gosh, my family will think I am SO over the top if they were to see a jar looking like this in our kitchen! I just have to do it once the store-bought bottle in my fridge is done with. Any particular fish you recommend, or conversely, advise us to steer clear of? I am giggling with glee over the wildness of this. I know, I know, it is healthier for us – but for the average American you have to admit this seems pretty out there. Thanks for the tutorial! I have made this with the Hooligan that run here every summer. Hoolies are also what are called candle fish, by the Alaska natives. All I can say is, it tastes fabulous, but the smell is enough to put you off food for a long time, lol! I also am curious as to what kind of fish can be used. I’d like to try this. I used fresh whole anchovies. I believe anchovy is the fish traditionally used for it in Asia. Yes anchovy is commonly used. Any small fish will work such as herring or sardines. I don’t know if I’ll ever be motivated to make a home made fish sauce, but this recipe looks good and intriguing enough to copy and hang on to “just in case”. Wonder what the difference between this and what we buy from the Thai fish sauce company. We keep ours out of the fridge and never worry about it going bad. Do you happen to know? Many of the commercial ones contain sugar for one thing. Yes and it’s great for people on GAPS, since they can’t have soy sauce or fermented fish sauce that has sugar added. I found this interesting article on how it was made traditionally, with info on better brands for those who aren’t going to take the plunge and make their own! I took the plunge and made some as i really wanted a sub for soy sauce and worcestershire sauce which are both off limits for us. It’s sitting in the fridge for the last week and looks totally gross especially on top. i’m just hoping it will turn out well (and slightly doubting it!). Ann Marie, how many weeks do you consider ‘a few’? update: It turned out fine and lasted for ages, but really it is SOOO pungent. I will not be making this again! I ended up using coconut aminos instead for a lot of things. Thanks for the recipe…someday I would like to try this…haven’t ventured into this yet, but I will eventually I am sure! Also pretty sure I will gross out my family as well… ;) Unbelievable to think we are so far removed from what they have done for centuries….sad to think about, in all honesty…. Thanks for expanding our horizons, AnnMarie! Thanks for this, and I would definitely like to try it, depending on fish availability, however, for those of us that don’t want to or can’t make traditional fish sauce, there is an online resource, out of California, owned by a Vietnamese refugee, who missed his families traditionally made fish sauce. So, he bought a small factory on Phu Quoc Island, and now sells his own fermented fish sauce, traditionally made—from salted anchovies, aged over a year in wood barrels! It’s called “Red Boat” (Redboatfishsauce.com). There are 2 grades available: 35*N and 40*N, which is a measure of the sauces intensity. I’ve already sent for some! Fish sauce available here doesn’t come close to this! Thank you so much wendyk for that information! Red Boat Fish Sauce is absolutely fantastic! I use it in lots of things — it’s great in Asian dishes, of course, but also on poached or fried eggs with avocado, in salads, and in place of soy sauce, tamari or salt in any savory dish. I make a lovely Thai dipping sauce with it using lemon/lime juice, chilies, garlic, onion or shallot, ginger and a touch of honey. This stuff would make old socks taste wonderful. I like to add Red Boat sauce to slightly cooled dishes to preserve the enzymes. Mmmm-mm-mmmm. Maybe someday I will muster up the determination to make my own fermented fish sauce, but in the mean time, I love my Red Boat. I have thought about making this too, since I can’t find any around here without sugar added to it. Is it going to be smelly? If you make it you will want to designate a container to make it in as well as a container to keep it in and a strainer, since you most likely won’t want to use any of those for anything else. We keep a swing top jar of fish sauce (with hot Thai peppers/garlic/touch of lime) at all times and use it at least once a day. We spoon the hot fish sauce onto food. It doesn’t smell like roses, but you don’t taste fish in the soup. It gives it a rich robust taste. Try it. It will amaze you. Most dishes have you add it and then simmer a little. It really adds a lot, both flavor wise and nutritionally. A bit of quality fish sauce in the soup should give you a salty taste, not fishy at all. Nor does it leave our soup smelling fishy :) But just sniffing it from the container is very fishy smelling. Does anyone know if you can use previously frozen fish for this? Or does it have to be fresh? Thanks in advance! Okay, this is probably a dumb question, but do the fish have to be raw? Or could you use the fish left over after making fish stock? I find that the fish left over after stock isn’t pleasant to eat, and would be glad to have a use for it. Does it matter what kind of fish you use? I was just studying this recipe. I really want to make ketchup, and of course it’s used in other things. Wow! This is interesting I’ll make this asap. I’ll use fresh sardines or anchovies. Do I need to gut them? I am also interested to know if you gut them. no you don’t want to gut them use heads and all! rule of thumb… you always want to use as fresh as possible. also I don’t know if it was mentioned in an earlier post but fresh water fish can be used as well. a $1 net and a couple bucks for the first kid to bring some back. also I understand, but have never done it, you can use whole tiny shrimp. P.S. If you like this recipe you will really enjoy the book mentioned in the article above Nourishing Traditions I own it and use it all the time. a lot of recipes in here call for fish sauce. Lovely! I will try it. Thanks for the recipe, I am absolutely doing this although I couldn’t justify using good fish to make this. We have carp in plagues in AUS so I might catch and chop one of them bad boys up. What’s the whey for and is it necessary? are there alternatives? I’ve never made a sauce out of fermented fish, and only first heard of it when I looked into Thai cuisine. But, we in Russia have always made fermented fish – specifically, herring – and I always make it. I’m always first in line at my fishmonger’s buying all the herring he has. And then last week he told me I needn’t bother come so early, because I’m the only one who ever buys the herring apparently! Haha. Sally Fallon says 3 days…. Vietnam says at least 1 year. 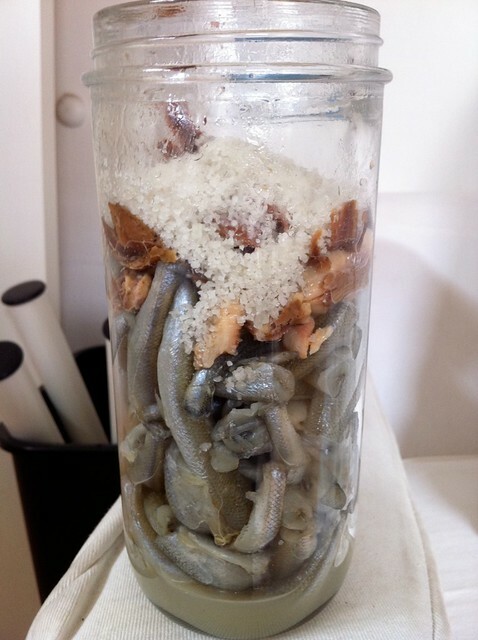 Question remains… how long do you want fish to ferment on YOUR countertop? I can try this recipe, I used fresh fish soup with fresh ingredients as flavor and taste.